We have heard a lot today from the Tories and their media allies about how they are now the “mainstream” party of British politics, following their manifesto launch. But this could not be further from the truth. They talk about inequality and injustice, yet it is they who are the originators of it. The Tory record is one of failure and hypocrisy, and this manifesto is no different. In their manifesto, the Tories claim that they “will forge an economy that works for everyone”, but over the last seven years this has been far from the truth. The Tories promised that they would eliminate the deficit by 2015 and admit that they are a decade behind schedule today pledging to do so by 2025. This government is on track to borrow more than every Labour government in British history combined, and seven years after their austerity project began, price rises in the last quarter outpaced wages. They used their debt problems as cover to withdraw support from the disabled, the elderly and other groups in need in society. Furthermore the Conservatives have overseen a cost of living crisis, more borrowing, and more debt, making working families pay for their economic failure. We should take no lectures from them on economic competence. The Tory manifesto promised to “protect the integrity of the United Kingdom, and to strengthen the Union”. But as Scottish Labour leader Kezia Dugdale has rightly said, the Tories risk breaking the Union once and for all. Thanks to May’s dogmatic and destructive position on leaving the single market and customs union, calls for independence have gained added strength in Scotland, divisions which the Tories have not just been unconcerned about, but have exploited for their own ends. The story is even worse in Northern Ireland, where the Tories have u-turned on a hard border with the Republic. In 2015 they committed to “no return to the hard borders of past”, whilst now they only commit to “as frictionless a border as possible”. The Tories lecture about strength and unity while old divisions threaten to break apart the UK – this is entirely of the Tories’ own doing. One of the most blatant attempts to mask their record in government comes in the section of the Tory manifesto that talks about their supposed passion for tackling social divisions and creating a country where “advantage is based on merit not privilege”. As people from all walks of life will tell you, this sudden adoption of Labour clothes on inequality just does not stack up when you consider their record in government. Firstly, as any teacher will tell you, Conservative plans on education will make inequality far worse. In my constituency, £24m a year is being cut from local schools, and it is a similar story across the country. Not only that, but Theresa May’s dogmatic commitment to grammar schools promises to send us backwards. Evidence shows they only accept 3 per cent of children eligible for free school meals against a national average of 18 per cent, and that tests at an early age advantage those who can afford tutors the most, not working class children. On housing, the Tory record on building affordable homes has been atrocious, promising to build 200,000 starter homes in 2015, but not having built one since then. On homelessness, the Tories in their manifesto promised to halve the number of rough sleepers by the end of parliament, despite the fact that the numbers of homeless people have more than doubled since 2010. And on immigration and integration, the prime minister who once sent “Go Home” vans around communities like mine in Streatham and has now committed to charging businesses £2,000 per year for every non-EU immigrant they hire for skilled work, now wants us to believe that she will bridge social divides and bring our country together. Don’t believe it. So when this prime minister stands up and says that she stands for unity, for equality, for social cohesion, and for a strong economy, don’t let her get away with it. Because the truth is that this government has been, and if re-elected, will continue to be a divisive, elitist force, who will exploit divisions, break up communities, and try to duck responsibility for its economic failure. Only the Labour Party can stand up for ordinary people, our public services, and for a fair economy. 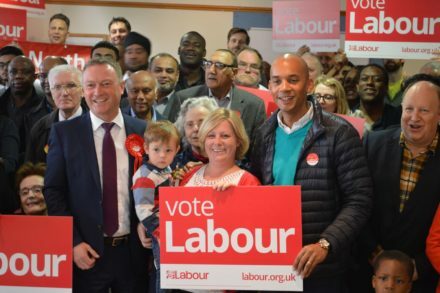 Chuka Umunna is seeking re-election as MP for Streatham.